If you drive a 2WD vehicle it is compulsory to carry snow chains while driving in the Alpine National Park area. The fine for not carrying snow chains in this region exceeds $350. Though not required to we also suggest to 4WD drivers with little or no experience driving on slippery alpine roads, to always carry chains when driving on icy or snowy roads. 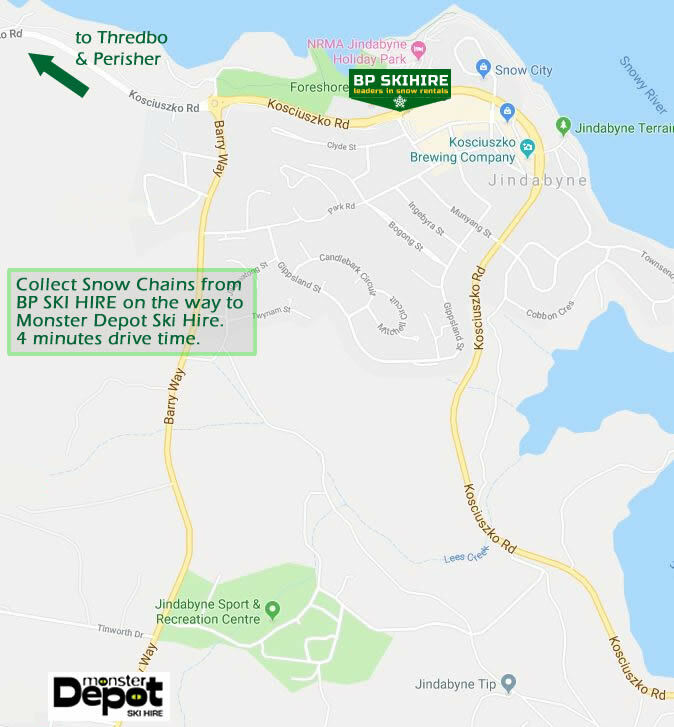 We recommend hiring snow chains from our partner BP Ski Hire, in Jindabyne, the snow chain rental specialists in the Snowy Mountains. BP Ski Hire staff will provide you with helpful advice and whilst providing a demonstration on how to fit chains, will test fit your car to ensure fitting and driving with chains on is a simple and safe experience. Use discount code: DEPOTBP19 for a pre season discount of 25%. Visit BP SKI HIRE & SNOW CHAINS to make your pre season order. When the season commences, a discount of 20% is available for all Monster Depot Ski Hire customers.